My teachers have continuously taught that Islam is a lifestyle. What that means is, Islam manifests in the way that we greet one another. For example, a lot of us will say “Assalaamu Alaikum” — but do we say it like we mean it from the bottom of our hearts? When we do say it, are we facing our brother or sister? When we do face them, are we looking them in the eye, and are sending them a smile? Islam is a lifestyle that must be expressed by our every limb and bone. Our practice of Islam is manifested even in the way we drive our cars, subhanAllah! When we are in front of a police car, we are abiding by the speed limit, right? Understand that when that police car is not there, Islam instructs you to continue abiding by the speed limit. Islam instructs you to refrain from cutting that car off on the road, even if you are in a rush. To repeat, Islam is a lifestyle — it provides for the Muslim a high standard of living. This lifestyle consists of submitting to Allah ﷻ, by following and adhering to the beloved Prophet ﷺ, who was referred to as a “mercy to the worlds” subhanAllah. Allah ﷻ says that in the Qur’an, and that should help us understand that as we walk on this earth, we are to be a form of mercy to the people, to the animals, to the environment and everything else. The internet as we all know is an amazing thing, and what it has done for modern society is incredible ma shaa Allah. It transformed into the world’s best source for information. The one thing that’s more recent of a phenomena that the Internet helped establish is “social media”. Social media is “the collective of online communications channels dedicated to community-based input, interaction, content-sharing and collaboration. Websites and applications dedicated to forums, microblogging, social networking, social bookmarking, social curation, and wikis are among the different types of social media (WhatIs.com)”.Some popular examples of social media would be websites such as Facebook, Twitter, or Apps such as Instagram. Moreover, these websites are utilized in many ways – some use it for business purposes, such as advertising and connecting with potential employees, employers, customers, etc. I personally would argue that a majority of social media users use it as a platform to express their thoughts and build off other users in this now very large social media community. Users post their favorite music and quotes; at the same time, they can observe fellow users express themselves as well, and ultimately, communicate with one another, developing a rapidly and continuous culture online. It’s deeper than posting pictures of cats; the mass exchange of thoughts, sense of humor, and talent is giving the Internet another aspect of human society to handle – culture. In addition, with the fact that a large sum of the world population uses the Internet’s social media in mind, an extremely plentiful and diverse set of sub-cultures have developed in social media. 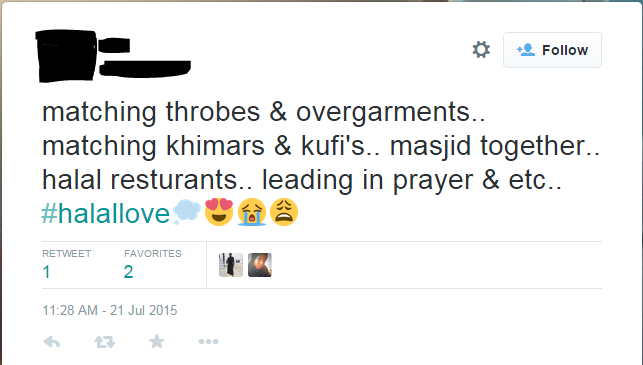 Since this is Your Muslim Bro, we will be focusing on the Muslim social media scene. Since social media tends to be used by a younger audience, the culture and the matters being addressed are usually matters that the youth care about. Let’s be real here – Muslims and non-Muslims alike, young folks are mostly focused on entertainment, romance, and what everybody else is talking about (‘trends’). Muslims and non-Muslims are posting about similar matters, such as – Memes, LeBron James’ hairline, One Direction, BuzzFeed posts, and unreliable sources of news/current events (sorry, but it’s true). Frankly, social media has it pros, but there are definitely some clear cons. Due to the points made above, we tend to digest a lot of unnecessary information. And let us make something clear, I am just as guilty as the rest of you. Furthermore, we waste our time on things that really have no positive impact on our lives. May Allah ﷻ guide us to a more productive lifestyle, ameen. Going back to the previous point of sub-cultures, young Muslim users definitely have made their mark on the social media community. And, I cannot lie, it is not the ummah’s best contribution to society. Please note that I am speaking about the general Muslim youth population and not our entire ummah at large. Muslim Social Media a lot of the time comes off cringe-worthy, shameful/shameless, and even at times as a borderline attempt of mockery towards the perfect religion of Islam. This social media disorder is something my friends and I titled as “Muslim Twitter”, despite it being a matter that touches all the other social media outlets. Before I unpack this, allow me to clarify – a disorder is something that can be treated, this is not the permanent condition of the Young Muslim. Therefore, my fellow young brothers and sisters, I hope that after I point this out, we can all make some changes with the way we do things on social media. 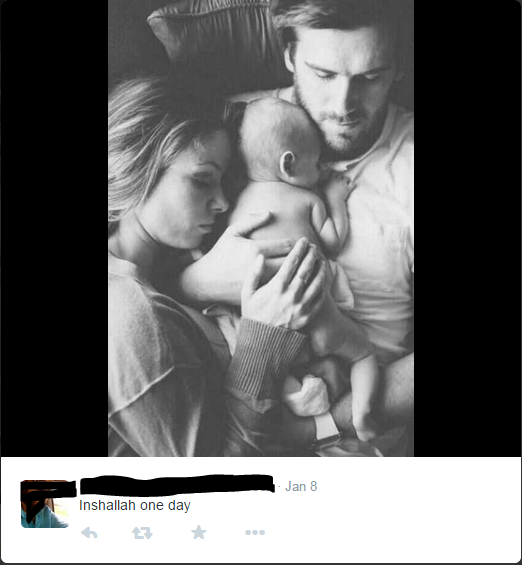 Just as fast as this sub-culture erupted, I pray that Allah allows us to amend at an even faster pace than that. Muslim Twitter, in my own words is an informal group of young people on social media that post things that commonly romanticize Islamic values. 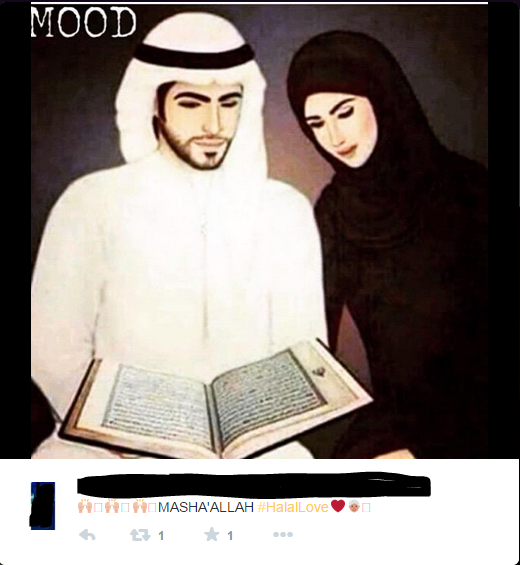 Some examples of values they romanticize are: modesty, following the Sunnah, prayer and marriage. While a lot of Muslim Twitter’s actions seems unintentional, its culture that is spreading reveals an attitude that is quite telling. Recently I have come to realize that the attitude is making Islam look like it can become some type of a pick-up line. Muslim Twitter does not realize this, but it is as if they are trying to devalue the religion of Islam. Below is a perfect set of real examples of Muslim Twitter. Shout out to @Muslamist and many others who just provided me with so many examples of the different shades of how ridiculous Muslim Twitter is. Exhibit A — To be honest, this might be a joke but either way — above is an example of romanticizing matters such as worship — making matters such as fasting and praying into a Twilight movie-type poem. Exhibit B — Cringing… so hard right now. Rather than focusing on the real purpose of Jumuah, which is remembering Allah (SWT) and recharging one’s imaan — Zayn Malik’s Quran recitation is the first thought that comes up? Exhibit C — Well, this is not exactly a Muslim exclusive-type of nonsense. I personally saw a post saying “Like this if you love Jesus, scroll down if you want your grandmother to die.” So, this is not too bad but it is still a component of corny Muslim Twitter. Exhibit D — Well, we’ll discuss this one in greater detail below. 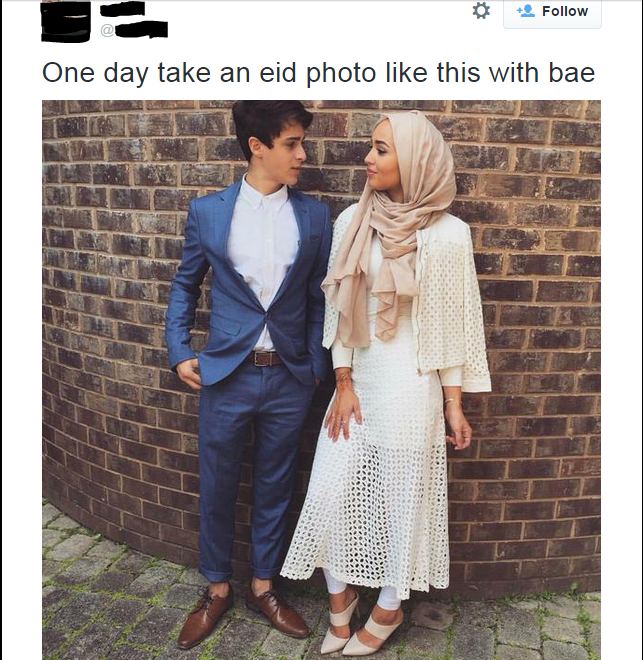 In my opinion, this post reveals a very annoying attitude young Muslims have on the hijab. 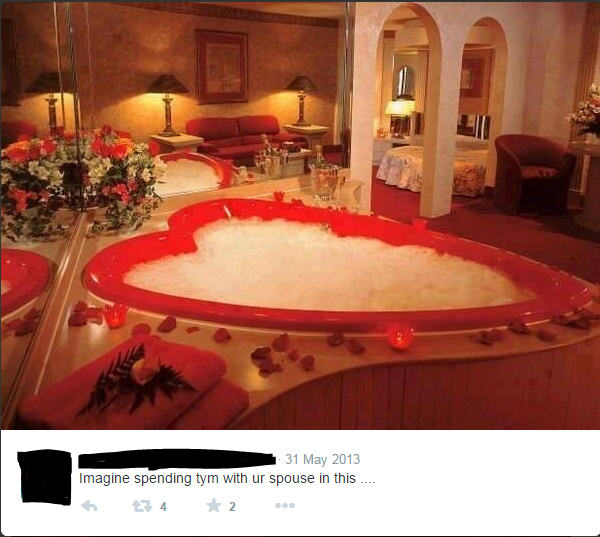 So yeah, when I read tweets like these, I start to cringe! The other day, I heard a rap line go like “you had me on my dumma (Arabic vowel), got me like ‘ooo’!” That is not the exact lyric because I wrote this not to expose people but to show people what Muslim Twitter is, and why it is a problem. It is a problem because look at the messages it is promoting. It is a revelation that our young Muslim brothers and sisters have this Disney-esque type of understanding regarding matters such as marriage. 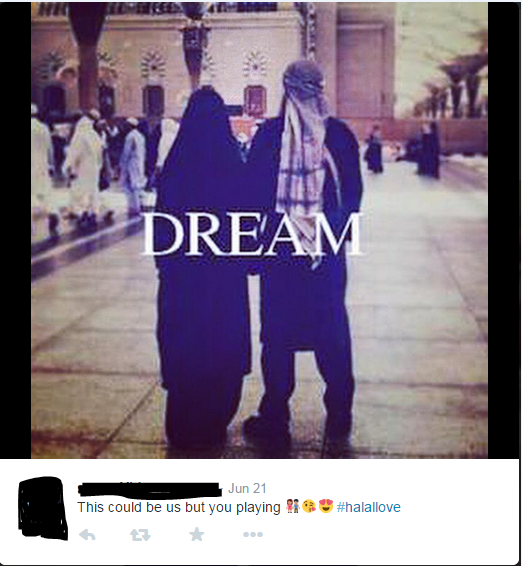 Our young Muslim brothers and sisters are tumblrizing Islam — using hashtags like #SimplyMuslimahThings and then saying things as cringe-causing as “When he wakes me up for Fajr <3”. When I see brothers post things like “when she takes her hijab off for me for the first time >>>.” These forms of expression on social media are nowhere near Islamic and must be ceased as soon as possible! Exhibit E — Due to this being an actual screenshot, I blocked out the username because this article is not intended to expose contributors of this culture but to criticize the actions. Exhibit E is funny because if you knew the whole story behind this post, this is a picture of siblings and NOT spouses. Therefore, from the initial stage this tweet is a fail haha. But other than that, what seems to be the problem? Other than it being obnoxious, what’s actually wrong with it? 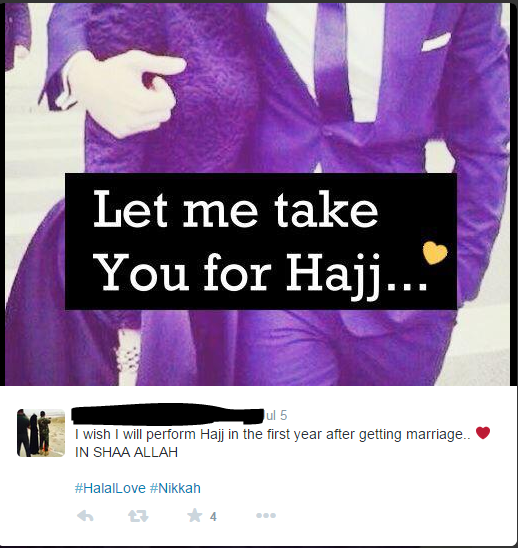 This sort of reflects an attitude that a lot of young Muslims have on marriage and romance. Alhamdulilah, social media is great but a well-known concept is — the most functioning relationships are the ones less publicized. That does not mean “hey couples, stop posting pictures of yourselves on social media” — that would be ridiculous, and the social media community would love to see pictures of y’all together every now and then. Just don’t push it! No need for a 4 times a day selfie, or a daily publicly posted essay about how much your significant other means to you — that’s the special kind of stuff, keep that between you two, communicate with one another in person and please for your own sake, do not just show affection on the keyboard. Social media has its pros but like I said, its cons are quite clear — another one of those cons would be that it is killing our genuineness in real life. You know that joke, of how we will post a picture of our dear mother on Mother’s Day, write a whole essay about how much she means to me, but we didn’t even say “Happy Mother’s Day” to her because we were busy typing that essay online? It can be very counter-productive. My favorite response to Exhibit E would be a golden meme like the following! Please keep that in mind! A WOMAN IN HIJAB IS LIKE A PEARL IN A SHELL. Wait?! How is the first analogy degrading?! Yes, a pearl is worth a lot and it is known to be rare ma shaa Allah… but why are we putting a price-tag on our sisters? A woman in hijab is not an expensive object, but rather an ambassador of our faith to the world. In a world of rising Islamophobia, our sisters are the ones that walk around and show people what Islam really is with their vibrant smiles, and proper etiquette. So do me a favor, and focus your appreciation to women of hijab by NOT objectifying them and comparing them to pearls, oranges, peas, jewels, and unwrapped lollipops (yes, apparently that’s a thing too). One last thing, after hearing from many of my sisters, and this is referring to the second image — people need to understand that the Hijab was not made for the sake of helping control men’s desires (sounds ridiculous right?). The Hijab was commanded upon our men and women to wear for the simple reason of showing outward, modest obedience to the One who created us. The hijab was not brought down to serve men but as a form of worship to our beloved Creator, Allah (SWT). So, show some respect, by thanking your female family members for being so strong for the sake of Allah (SWT). And if this is corny, this is the good type of corny haha. I covered various matters regarding Muslim Twitter. Perhaps, I came off condescending — if you felt disrespected, by Allah that was not my intention. Nevertheless, this problem is very concerning to me. Whenever I open up this discussion with peers, most of them support me but there is always that small but vocal group with some criticism to contribute to the discussion. They cry in unison, they pull the “don’t judge people card.” Brothers and sisters, our dear teacher Imam Omar Suleiman put it best — “If my friend saw a scorpion on my back, I would want them to warn me!” Another thing, to resort to “Only Allah can judge me” every time you are confronted because of your mistake is very irresponsible. When someone is caring enough to remind you of your potential on this earth, appreciate them! Allah (SWT) indeed is The Judge, but do we not want to be prepared? Brothers and sisters, please do not walk away from this article feeling like I am looking down upon members of this cringe-worthy “Muslim Twitter”. To confess, there was even a time that I used to think the “Hijabi Women are Pearls” cliche was clever and empowering. I meant well, but little did I know that I was demeaning the very sisters I thought I was appreciating. I am not immune to criticism, nor was I free from this corny/devaluing mindset of Islam. That’s why I typed this… because I want to at least give you an idea of why we need to stop Muslim Twitter from doing what it’s doing! I want to make two very important point — firstly, Islam is a lifestyle, a way of life that is preserved and defended by Allah Himself; therefore, its value will never go down in actuality. No matter how hard people try, Islam will always prevail — because the Truth always prevails. But, as representatives of this beautiful faith — we have a major responsibility in promoting and representing this lifestyle PROPERLY. Therefore, the idea of a “Muslim” Twitter should be positive and empowering, not this “I want you to be my Khadijah (RA)” type of social media population. Secondly, the problems with Muslim Twitter are not just something we can point blame at some young Muslim brothers and sisters alone — the blame is on all of us. 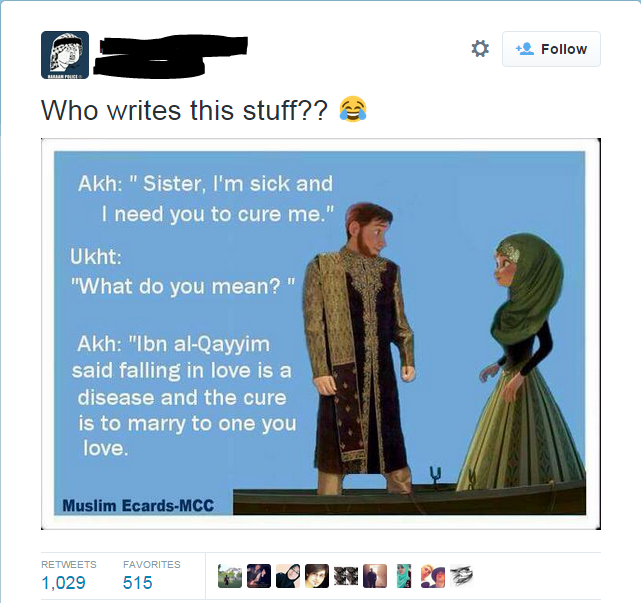 The fact that some of our youth have such a Twilight/Disney love story type of understanding regarding marriage is a result of an improper Islamic education. Living in the United States, it is natural to fall into trying to appropriate American culture to your religion but as Muslims we must remember that Islam has some core values that are never to be tampered with such as prayer, following the sunnah and marriage. To make a final point on this matter, I think that with mentalities like the above, our young Muslims’ spirituality is in danger. I am a young brother just like many of us here, and I have seen what this unhealthy, obsessive, hopeless romantic state of mind does to my fellow youth! It can be pretty alarming — as Muslims, we need to understand the vast wisdom behind marriage in our faith. When looking for a spouse, we have a set of characteristics we look out for — we are not supposed to be obsessing over a specific person if we are not married to them. A lot of us in our age, we have fallen in deep love with someone we are not even married to! Spiritually, that can be very harmful. Of course our Lord, Allah (SWT) is the one who puts love in our hearts, but the wisdom behind marriage the Islamic way is that one does not get attached to someone they are not married to until the nikkah is finalized. But honestly, this really opens up a much bigger topic that can be addressed in another article in shaa Allah. May Allah guide us all, and instill in us patience and wisdom, ameen. May Allah protect our youth from these trials, ameen ya rabb. As a brother that wrote a whole article criticizing the obnoxious characteristics of Muslim Twitter, I would like to conclude appreciating those who make social media a pleasurable experience! Those brothers and sisters that use their Facebooks and Twitters like anybody else would but because of their genuine love for the religion, they naturally post really beneficial Islamic reminders. I am talking about those brothers and sisters that share inspirational ahadith, stories of the companions of Rasulullah (S) and they do it all minus the Disney/Twilight-esque flavor. These Muslims are genuine role models in our communities that restore my hope in our presence as Muslims on the social media networks. These very people will be the ones responsible for the advancement of our communities in this American society by the will of Allah! I would like to label these people as the genuine Muslim Activists — these are people who are not just representing Islam to non-Muslims properly, but teaching and spiritually empowering their Muslim brothers and sisters. We appreciate you all, and we pray that Allah (SWT) continues to accept your services to our global community — Ameen. So with that, I pray Allah (SWT) forgives us for our shortcomings; I pray that Allah (SWT) blesses us in this life and the hereafter; I pray that Allah (SWT) guides us towards the path that pleases Him; I pray that Allah (SWT) guides us to the ultimate victory — the Eternal Bliss, Ameen. If anything I said was good, alhamdulilah — the praise and credit comes from the One and Only diety worthy of worship, the Almighty, the Wise, and Most Merciful Lord — Allah (Azza Wa Jal). Now, if I said anything that was wrong and it angered, offended, upset you — I am only human and it was not my intention; I humbly ask you for your forgiveness, and ultimately I ask Allah (SWT) for His Mercy and Forgiveness. Ameen thumma Ameen. And Allah knows best! I would like to conclude this article with a funny tweet from one of our curious Muslims trying to make sense of everything!